A brief notice appears at the banks throughout Oberin. In the waning days of this Fighting Moon, Year 449, a disturbance was located in the lower levels of the Maralian Keep, which caused many of the Guards to vacate their posts. Marali and her allies quickly rallied and fought their way through a few Wraiths and Liches beneath Marali’s walls. Seeking signs of a struggle, they thoroughly combed the Catacombs and entered a dank, subterranean cave wherein they found faded footsteps, too indistinct for even their Ranger to follow. Be advised to use caution when journeying through the network of tunnels from the Volcano to Marali, along with the island-bound ladder and passage between the Lerilin and Marali continents. As the group located numerous unusual threats, travelers should accept that familiarity with the depths should not guarantee safety. The Marali Vanguard thanks you in advance for your cooperation and suggests you report any unusual sightings to a Maralian officer or soldier. A significantly longer and less reserved letter appears on the desk of Captain Octar. As you may have noticed yourself, McTyr and a significant portion of Marali’s garrison are missing. I received word sometime late this Fighting Moon—egads, I did not have the togetherness befitting an Armsman necessary to record it—that Wraiths had be sighted on the level directly below our Keep. As you might imagine, I was quite alarmed—moreso when two Wraiths appeared on that same sewer level and promptly ended my life. Thankfully, Elpiis and Varto arrived and one of them restored my life, for the time being. The first pair of the Wraiths was hardly the end of our worries, as Lenne, Shivani, Laricen, Jedd, Suscane, Kylar, and perhaps one or two others I neglected to note descended further. Not long after reaching the darkest levels of the Catacombs, we encountered a deadly pairing of a Wraith and a Lich. Captain, I do not want to downplay this threat: we fought at least half a dozen Wraiths and perhaps three or four Liches. This represents a departure from the norm so disquieting, I hesitate to speculate on what may have precipitated it. My theories, as you might expect, are grim. I am rather concerned that Marali has made a number of enemies that now seek to ruin it from the below-ground up. Most notably, I suspect that sinisterly-garbed Black Magician may be somehow collecting and corrupting the souls of the many Ants we have slain, perhaps as a darkly ironic demonstration of how a militaristic group will never escape the cycle of violence. I despair at the thought of our old sins crawling up from our sewers and vast networks of tunnels, but I fear that such a notion may be accurate. Another theory I constructed involves the whiff of poison detected in the Keep. It has been long enough for the Ant-killing poison to soak into our sewers and other septic regions of Marali. Perhaps some lingering fell magic combined with the toxins to create truly ungodly creatures. In some ways, this might be worse than my other theory. I must finally move to the one issue I was hoping to speak with you in person about, but I suspect I will not have an opportunity to do so in time. As such, McTyr’s disappearance deserves some mention, as does the corpse of either Kang or Emma the Hell Hound. I placed what is clearly a scrap of McTyr’s Purple Robe in Valerquez’s chest, if you would like to inspect it yourself. I hope you determine that the conclusion I reached is not the correct one, but I have little doubt left, certainly far too insufficient to offer me any comfort. If McTyr truly has vanished, that would mean that you must assume the mantle of Commander, Octar, until we can either recover him or locate a [the writing abruptly stops here]. I know this presses a weight down upon you I cannot imagine, so to better support my friend, I will temporarily take the Captainship and gather what I can of the Vanguard to launch a full investigation. I, personally, will remain in and about Marali to keep it as safe as possible. I do not want to believe anything could have happened to McTyr, but after Vaup, I have learned hope is a luxury soldiers cannot abide. I will continue to search even as I know the worst will come to pass. During the night, a robed woman sneaks into the solemn hall. She got acquainted to the place in the last few moons - a place where she never thought she would spend all this time. She knew where she was going, which chest to open, which guard slept lighter in his post. The hidden chest. The ranger’s chest. She opened the lid without difficulty, even with a slight frustration for the lack of challenge. "They call this security?" She chose a spot on the wood, under the lid, close enough to the border to make it likely that the ranger’s fingers would touch it. Then, with the tip of her dagger, she wrote a word. A set of three letters are exchanged in quick succession. Rumors of your adventure in the catacombs have reached me even before your own dispatch. I should very much like an update, or I will have to assume you have been eaten by wraiths and send Zaf to come fetch you. My deepest apologies, good sir. I have been chasing a number of time-sensitive rumors myself over the past several days, and as a result I have quite a bit to share. That being the case, I must beg your pardon in advance if you take objection to the rambling nature of my tale – time may still be of the essence. I will assume you have read Armsman Nial's posting. What he did not add was the torn piece of Commander McTyr's robe found beneath the fort, alongside the corpse of his fallen hell hound. This, on top of the rumors of the commander's disappearance, was more than enough warning of what dangers we faced ahead. The fighting in the catacombs was as gruesome as you could imagine, and took a heavy toll on our energies and spirits... perhaps that is why we decided not to press on to the Lerilin Atoll that day (the 180th, for your records). Instead, I embarked with a few others on a long journey through the countryside, checking in at Jassen's Cave and the Dragon's Mouth, before climbing up on my own to the Mountain Hideout. My searches were all in vain, however, and so when the predetermined date came – the 192nd – I ventured to Lizard Isle, where, as you already knew, Varto and Bronte had previously reported heavy brigand activity. We were joined there by Lenne, Laricen, Rivvyre, and Matthias, and fought brigands and lizards all throughout the day. It would appear that the brigands had been seeking out a little statue of some sort, which we eventually found in the southeast lair of the fort. Laricen acquired the statue during the divvying of the spoils; I am unsure what exactly was so special about it – perhaps time will tell. Why or how these outlaws managed to secure the lizards' cooperation is another question altogether, as they did appear to be working in tandem. It was only afterwards, while recuperating in Mirith, that an offhand comment by Rivvyre reminded me of the Lerilin Atoll. As we still didn't have any other clues about the mysterious goings-on in Marali, we decided straightaway that it would be prudent to investigate. The two of us plus Matthias made it there on the 193rd, finding a note affixed to a bracken. All it said was, "Meet you at the atoll." We briefly returned to Mirith to resupply in preparation for the voyage, and finally reached that imposing island on the 194th. There, we encountered wave after deadly wave of gapers and serpents, in numbers far exceeding the observed norm. But the most interesting discovery awaited us on the central isle. On the primary beach was the remains of a small campsite, with a few different sets of tracks. I have attached a sketch of the camp below. At least three people had been present, as there were three different sets of tracks on the sand – two belonging to average adults, the third belonging to someone with small feet. There also appeared to be the trail of something heavy being dragged into the tent – an unconscious commander, perhaps, or some other prisoner? Lastly, further up the slopes, there were marks of two feet that did not match any of the other tracks. I suspect our prisoner managed an escape. This was all we could manage to find, however. Beleaguered by the seemingly endless onslaught of serpents, we decided to leave the island behind, and returned again to Mirith. As I write, Rivvyre suspects that we were not sufficiently thorough in our investigation, being so distracted by the beasts, and thus we plan to revisit in the very near future. But before we do so, I must raise one last concern with you, lest I forget: that day in the catacombs, Nial's tone and mannerisms seemed to imply that there was something he knew about Commander McTyr, something he wasn't at liberty to share. So visibly discomforted was he, that I declined to push any further, if only out of respect (you will surely chide me for this, but I stand by my decision. I just can't quite believe that a man such as Nial would withhold anything important without just cause). Now then, there are several pressing matters to attend to, so I will leave it at that, but rest assured: you will be hearing from me soon! Rivvyre was right – I returned on Day 195 and sure enough, not far from the campsite I found a skeleton key, all but invisible amidst the fog and the sand. Expect more updates soon – I hasten now to the north. "The Special Advisor requests to meet the Vanguard. He has urgent orders from the Commander regarding the fort. Please, report when back to town." First off, I must admit: the title of "Special Advisor" still gives me chills. You must forgive me for asking, as the mists of Maralian bureaucracy tend to cloud my vision – but does Estess Vorund still serve in that capacity? That silver-tongued villain had almost made me believe that Captain Octar was the one behind the murder of Major Sule Tesdor, back in 439. As it turned out, of course, the murderer was Vorund all along – and Marali's inter-guild investigation all but proved it. But seeing how Vorund fled before justice could be handed down, I would not be even remotely surprised if it turned out he were the one behind the recent troubles up north. Obviously, the Vanguard will have not forgotten this treachery, so I feel no need to warn them. They've most likely even promoted a new advisor by now. I will however inform them of the events at the Atoll, and will gladly relinquish of the skeleton key, should they require it. Following this, the fighter prepares a note addressed directly to Armsman Nial, asking for an in-person meeting, with promises of information that will surely prove advantageous to the city's operations. Finally home, the fighter muttered as he approached the hall of Citirnitas Aegis. Several letters on the center table reminding him of matters that required his attention. He sifted through the mails noting trying mentally organizing recent chain of events as he drafted a letter to Hayate. I write to inform you about strange series of events that occurred recently. As you recall, few days ago we were ambushed by a band of thugs and a Brigand mage underneath the volcano. We also found a sorcerer’s head but I still not know who it belongs to. My guess is maybe Katabasos or another Artificer. We previously met Katabasos and slew an Artificer in this same dungeon while looking for the Book of Sky. Lenne has custody of the Sorcerer’s head and we may consult with Brigobaen priests about it in the near future. Commander McTyr, Commander of the Armed forces of Marali, is missing! Clues led us to the Marali Keep but we only found a corpse of the commander’s wolf. We decided to investigate Marali Catacombs and were ambushed by at least 6 wraiths and 3 liches. We found footsteps leading towards Phase Serpents lake, but the perpetrator had already disappeared. There is still no news of the commander and we do not know if he is dead or alive. A note posted at Marali Bank indicates a special advisor of Marali is currently seeking audience with members of the vanguard. Myself and Varto set up camp in the Lizard fort few nights ago and we woke up surrounded by brigands who were looking for a little statue. We were able to clear the fort with help from Matthias, Lenne, Jedd, Rivvyre, Laricen and recovered the statue. Jedd, Rivvyre and Matthias discovered several foot tracks at the atoll North of Mirith. Two of the foot tracks looked like those of adults and the last looked like that of someone with small feet, perhaps a child? Quick search revealed a Skeleton Key However, they were unable to thoroughly examine the isle due to attacks from several sea-serpents and gapers closeby. Ryen, Matthias, and Elipiis were attacked by over 40 pixies in the cave. We do not know the cause of this disturbance. Perhaps the horde of pixies sensed danger and sought refuge in the cave? A small party visiting Aborek discovered a shelter in the dungeon but could not find the fellow who had taken up residence there. Finally, I heard rumors of several creatures gathering on the black isle (AKA PVP) and sent an artist to observe from the outskirts. 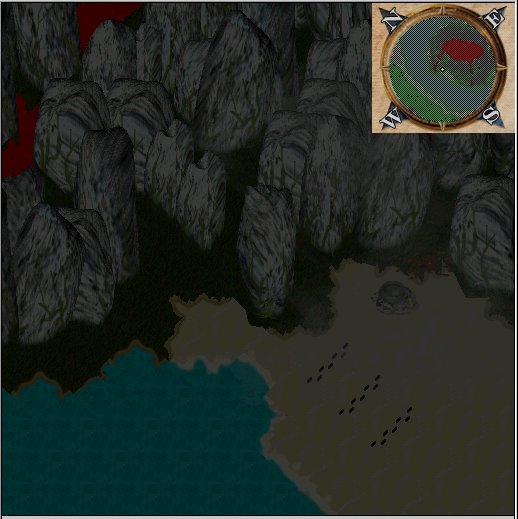 The results were simply frightful: the isle was overrun with Bone Mages, Ice Dragons, gapers, hell mages, you name it. The most alarming of all, an Ancient Black Dragon was also present. As I glossed over the artist’s findings, Shivani reported unusual activity NW of Mirith. I arrived to find Hill giants collaborating with with brackens, Stone Golems, Bone Mages at Rock Maze guarding a chest. Myself, Lenne, Rivvyre, Luciella, Varto, and Matthias cleared the area and secured the chest. It contained exactly 50 pure black crystals. Why did these creatures have the pure crytals? Is this related in anyway to the mob at the black Isle or the brigand mage or the pixies? I am just as confuse and have no answers. Maybe, just maybe some answers might lay hidden in PVP and we may find out after a fierce battle. 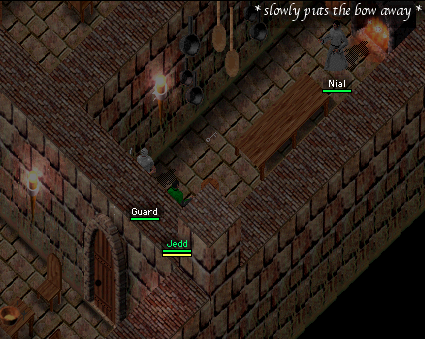 First, Armsman Nial is now Acting Captain Nial, as Captain Octar has been somehow incapacitated. Second, the skeleton key is now in his possession, safely stowed in what he assured me was the Marali Vanguard's most secured and magically-warded chest. 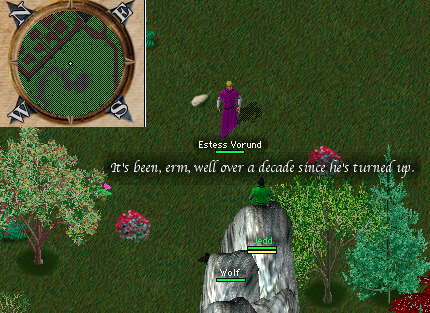 Third, Estess Vorund is no longer the Special Advisor, and probably hasn't been for quite some time. According to Nial, Vorund is "no longer a threat to Marali, in his present state." I dare not conjecture as to what he meant with this. The identity of the current Special Advisor remains a mystery, at least to me. Fourth, Nial seems to know something that we do not, in regards to Sister Adla Thera of Brigobaen – and this "something", whatever it is, is enough to make him extremely suspicious of her. I find this more than a bit surprising, as I have never had any reason to suspect her of any wrongdoing in the many years since we first made acquaintance. From the restoration of Erich Kaestner to her travels with Siegal... and from her protection of young Tiatan to her presence in the Liberation of Foehan, I have only ever known her to fight for what is good and right. Thus I find it rather hard to believe she is deserving of Nial's suspicions. Clearly, there must be something else going on, something more insidious. I draw your attention to it now, in the hopes that you will be able to help solve this lesser mystery and clear Adla's name. But then fifth, last, and most pressing: it has just now come to my attention that Ryen was implicated in some sort of scandal here, only a few moons back. Apparently, while Marali was being overrun with ants, he dumped massive quantities of poisonous liquid over a wide swath of territory, in an attempt to deal with the ant problem more decisively. It was most effective, of course, but overly so: the toxic pollution went unchecked, and seeped under the city and into the sewers. There is even a chance that it may have combined with some dark magics below, giving rise to all manner of unholy creatures such as the ones recently found in the catacombs (this last claim is still just speculation, and is soon to be the subject of a wizard-led investigation). I leave these matters to you, of course, and will await the word of the full body of membership before any such resolution is passed. We will be in contact again soon. Estess Vorund has returned. But something terrible has happened to him – nay more, he appears to have completely lost his mind. He genuinely believes that it is still the Year 436, a stunning conclusion which would be nonetheless indisputable to anyone who could've witnessed the bizarre things he said to me in a chance meeting outside the mines. I could not even recognize him – it still amazes me what time can do to a man; obviously, I imagine that the last ten years have been more cruel to Vorund than to most. My first thought, of course, was that Acting Captain Nial had been mistaken in our earlier conversation, as here was Estess Vorund standing before me, announcing himself as the Special Advisor to the Majors. He was there looking for Commander Vaup and Captain Fang – and that was just the beginning of the oddities. By the time he started to express his concern about the D.D.D. forts of Rivolus – forts which were destroyed ages ago... it was then that I fully realized what was transpiring. He asked where I hailed from. I could not say the Vale, as the answer would not have made any sense to him. I settled on Duldrus, and he then asked me if I served the king – Galandir, to be precise. I didn't correct his assumption – this being 436 and all – and he then directed me to tell King Galandir that Marali will handle the fort in her own territory, and that the King had better do the same in his, instead of losing scepters. And just like that, I was suddenly transported back thirteen years into the past. I gave Vorund my best salute, and told him that I would pass on the message to Galandir. He thanked me, asked for my name, and said he would remember it. I have my doubts. Now: you must forgive me, my good sir, but right now I simply cannot stomach the thought of offering any further analysis as to how Vorund ended up like this. Surely you've already come to the same conclusions as I. I will note, however, that the sight of him was almost enough to move me to pity, even knowing full well the extent of his heinous crimes against Marali and indeed, all humanity. Toward the end of our encounter, I even dared ask him for the names of the current Majors of Marali, and he responded with Cesca Andon and Sule Tesdor. So yes: the damned fool hasn't even murdered Major Tesdor yet, at least not in his mind. Marali is a terribly strange place, my good sir. I shall be spending as much time as I can in the mines for the foreseeable future – rocks are so much simpler than humans.